If you like getting high from your munchies in style, this is for you. OK, so there I was, sitting around on a pretty good day for January (California…January…sunny and T-shirt weather!). I wanted to eat something interesting. And then I remembered I had put a lobster tail away for just such an occasion. Given the budget we’re on, I don’t eat lobster very often. Try never. But a few months ago I happened to run across a seafood sale and BOGO (buy one, get one free) and so ended up with this lobster tail and a great salmon filet for about what I could actually afford to pay for just the fish in the first place. 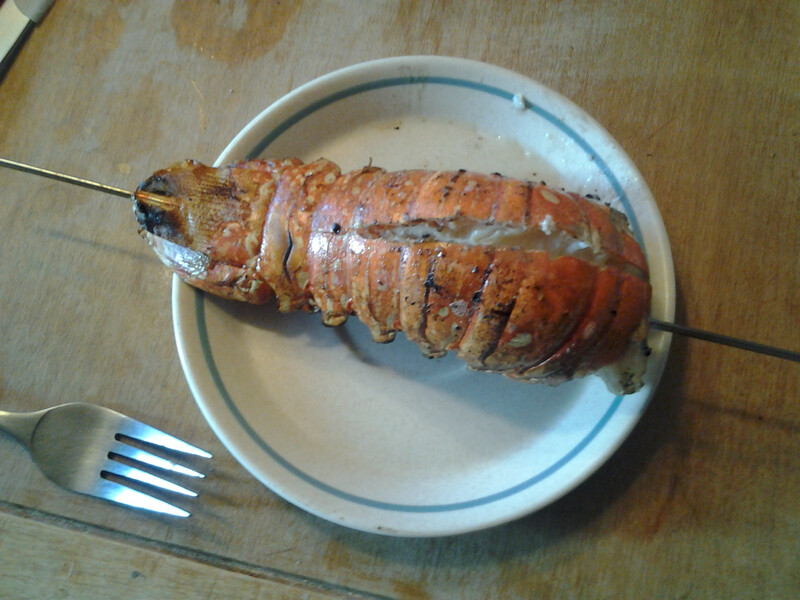 I’ve never barbecued a lobster tail before (hell, I’ve never cooked one at all, but I sure wasn’t planning to dunk a live one in a pot), so I checked a bunch of online how-to-grill-a-lobster recipes, and ended up with this one as the best. Then I took the thing out of the freezer to defrost, and today I followed the instructions to the letter. Well, almost. I saved about a tablespoon of butter sauce for dipping the pieces in, and it all worked pretty well. You do have to like cannabutter, but the ratio I used means that the canna doesn’t overwhelm the butter (or the lobster, for that matter). I also cooked eight burgers while I was at it. (That’s for my wife, so she knows I was being useful around the house). Sorry! That’s pretty much what THC-infused butter is called everywhere.